The Smart Business Modeler offers a unique database of over 300 business models. 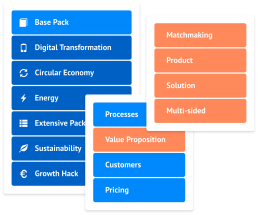 Business Models are small scale descriptions of a business, allowing you to design, test and communicate the way you create and capture value. Do you want to copy a successful business model of an already successful company? For that you need to deconstruct their business model in its parts to better understand how they achieved greatness. How? Easy with business model patterns. Patterns are those simplified, modular elements that make up a business model. They are proven generic solutions to specific problems that companies have faced. They are modular and can be combined with other patterns to solve problems and create maximum value. We also offer more specialized databases such as for the Energy Industry, Growth Hacking, or Smart Cities. Contact us. Ready to explore business models?